April 21, 2017 – An active region of the sun that had just rotated into view blasted out a coronal mass ejection, which was immediately followed by a bright series of post-coronal loops seeking to reorganize that region’s magnetic field on April 19, 2017. The bright loops are actually charged particles spinning along the magnetic field lines. Solar observers have witnessed this phenomenon numerous times, but this was one of the longest and clearest sequences seen in years. 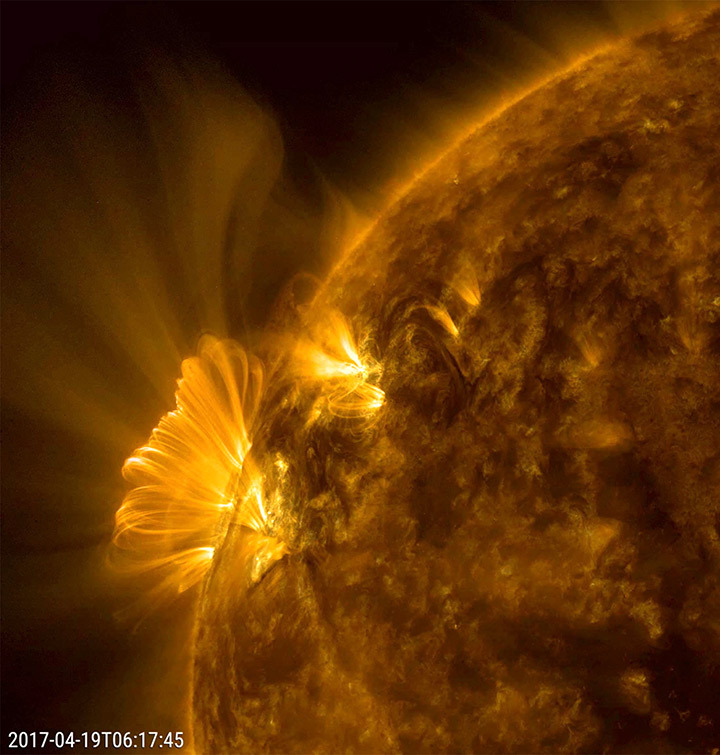 The action was captured by the Solar Dynamics Observatory in a combination of two wavelengths of extreme ultraviolet light over a period of about 20 hours. Goddard Space Flight Center built, operates and manages the SDO spacecraft for NASA’s Science Mission Directorate in Washington, D.C. SDO is the first mission of NASA’s Living with a Star Program. EVE was built in partnership with the University of Colorado at Boulder’s Laboratory for Atmospheric and Space Physics (LASP). SDO was launched on February 11, 2010 aboard a United Launch Alliance Atlas V rocket from Cape Canaveral Air Force Station, Florida.